Last week it was my friend Lou‘s birthday and I made her this brooch. Being in full time work at the moment means I haven’t had much time to sit down at the sewing machine and make clothes*, but I have been fiddling with bits and pieces to make accessories. 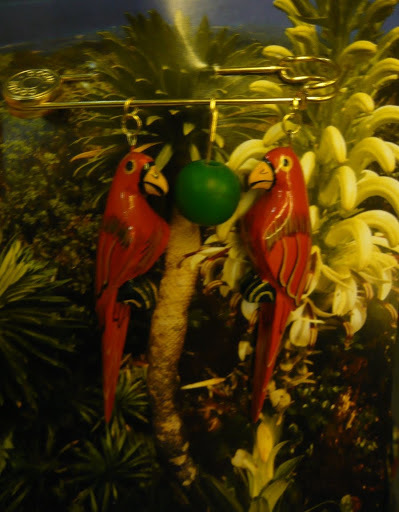 The parts for this brooch (a kilt pin, actually) were originally parrot earrings which I removed from their posts, while the green apple dangling between the two birds is a bead I made from Fimo ages ago. *This explains my lack of outfit posts lately. Sorry! oh its lovely. I like to use Kilt Pins too for making brooches, especially knitted ones, that you can use to hold a scarf together.